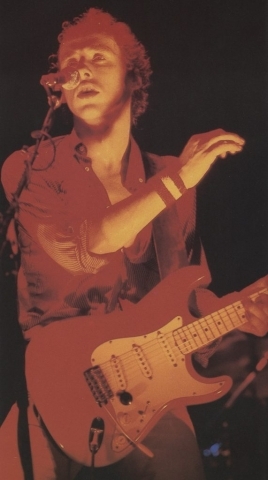 Info: Mark got this guitar only a few months later than his first Strat. 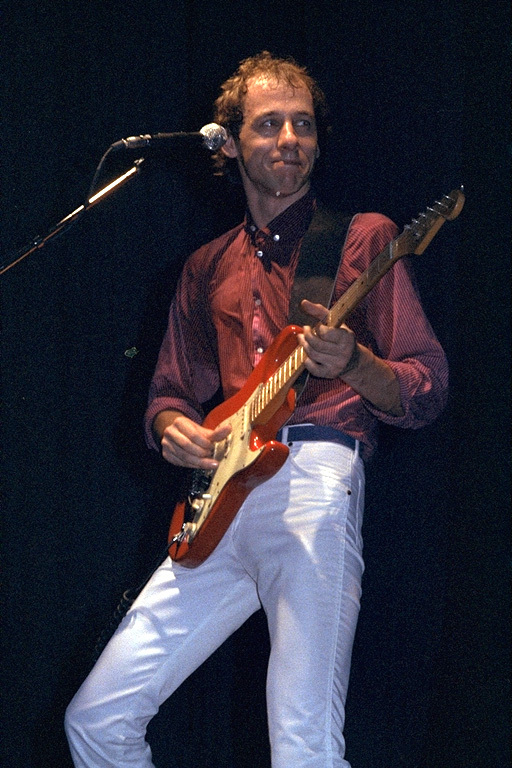 Right away it became his main guitar on stage during the time of the first two Dire Straits albums (with exception of the last months in 1978 and December 1979 when he played the other one on stage). It was probably used on both albums extensively as well. 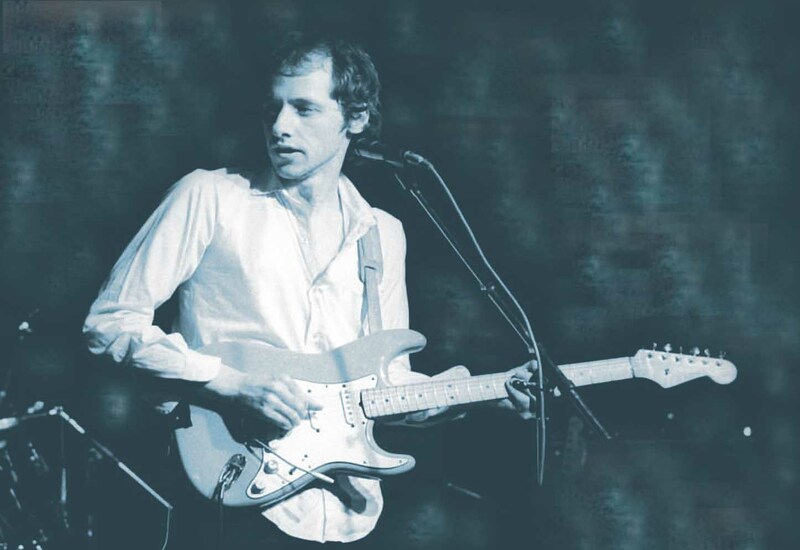 Mark thought it to be original Fender from the early 60ies, but according to John Suhr, who serviced Mark’s guitars in 1982 while Mark recorded Love over Gold, Local Hero and Bob Dylan’s Infidels in New York, parts of this guitar were not original Fender but from a Japanese copy. 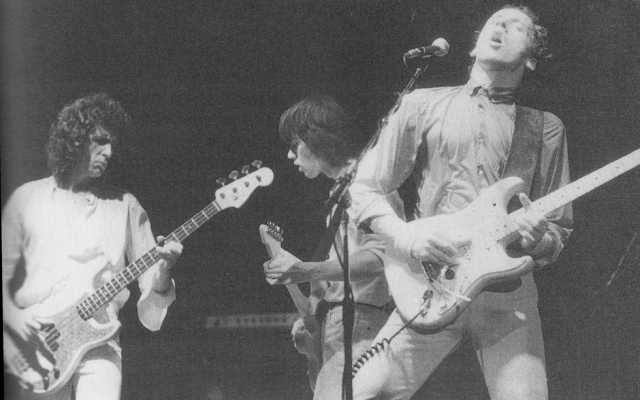 I doubt that it was all Japanese, as generally Japanese copies were not as close to Fender vintage guitars in 1977 (when Mark got it) as they were some years later. Besides, some parts seem to be modified (e.g. new pickguard, new maple fingerboard, new finish) which makes it even harder to determine what is original and what not. The Fender decal is one without patent numbers (which have been introduced there in late 1960) so the decal is a replacement or – if original – the guitar has a 1959 0r 1960 neck. 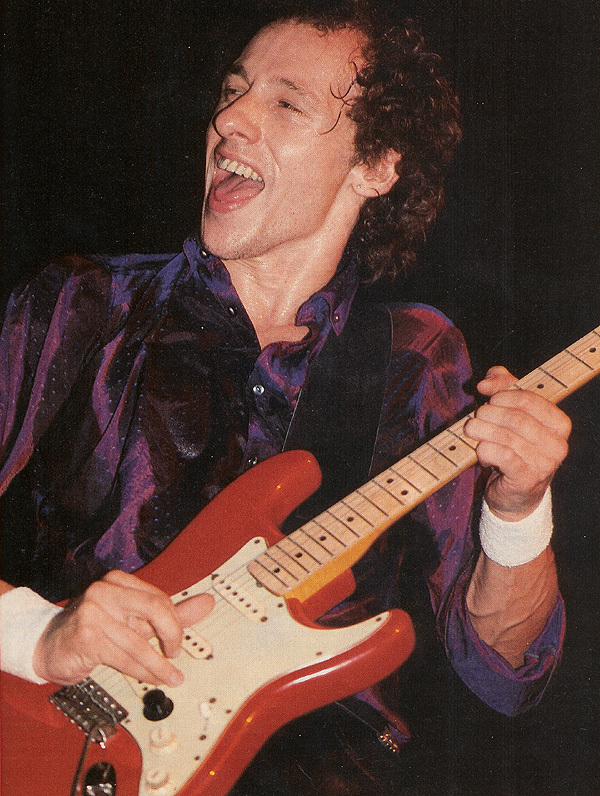 When Mark got this guitar it had a non-original pickguard where the position of the volume knob was slightly different. As Mark’s way of resting his right hand on two fingers might easily cause conflicts with the volume knob at its normal position, this might have been a custom job for Mark. 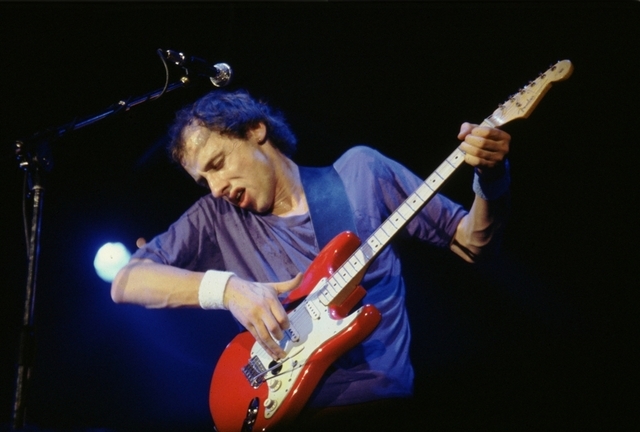 However, most of the time Mark did not have this custom pickguard on this guitar but the one of his other Fender Strat, in other words he normally put that pickguard including the controls and pickups on that Strat of his two he mainly used at a given time while the other guitar with the custom pickguard was the backup. More on this in this blog post. At about 1982 John Suhr replaced the neck with a one-piece maple neck (possibly a Schecter neck with a Fender decal). I once talked to Mark’s friend Steve Phillips of the Notting Hillbillies, the one who did some work (closing f holes and a paint job) on Mark’s black Telecaster Thinline, and asked him if he also worked on this guitar. He told me that it was not him but Sam Lee, a luthier from Soho. 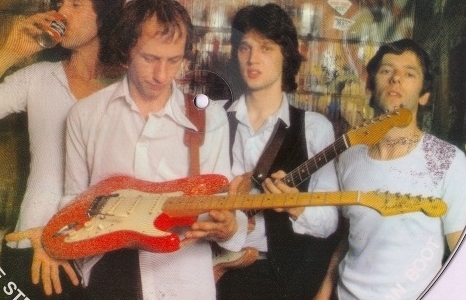 Possibly Sam Lee modified some things on this guitar which was maybe sold to Mark as original vintage Fender (remember, in 1977 a vintage Fender was basically a used guitar, the prices had just begun to climb, and there were hardly any experts, Mark was not even a professional musician but just a guy who bought a guitar). Soon after learning from John Suhr (maybe because of this?) that this guitar was not a vintage Fender, the guitar disappeared. 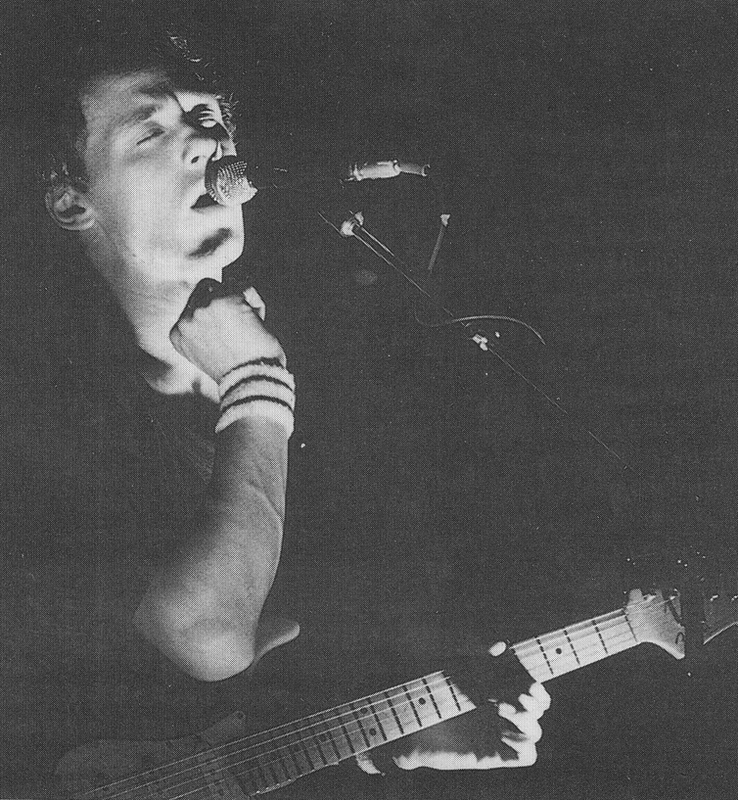 There are some hints that Mark gave it to some charity but I don’t know where the guitar has been since then. the last pic is during LOG sessions right ? is it a hint that the guitar fetaure on the album ? I thought that at the time he only played schecters ? about the first date seen with MK, I agree that it is in december 77, because in Oldfield’s book, Ed Bicknell tells his first meeting with a band (which was in fact in december 77), and he says that “Mark played a red strat” and it made think him at H. Marvin, and “he bumped the red strat backstage” ! I guess I already asked you before, but I don’t recall the answer : is the volume poti on this guitar a normal poti, or is it like on the rosewood strat ? why there is no white knob ? 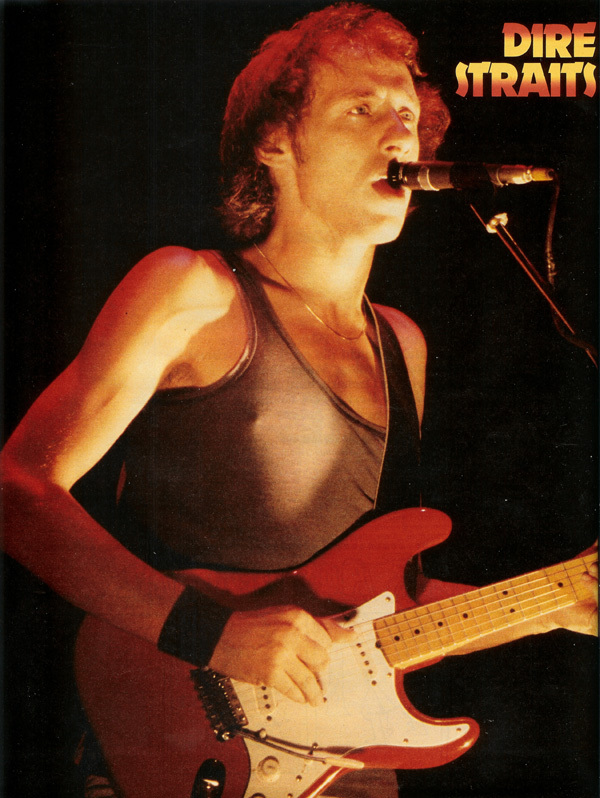 Did Mark had 2 different black knobs, or pics with black knob means always that it is the other pickguard ? Are you aware of pics with the orignial white pickguard AND a black knob ? 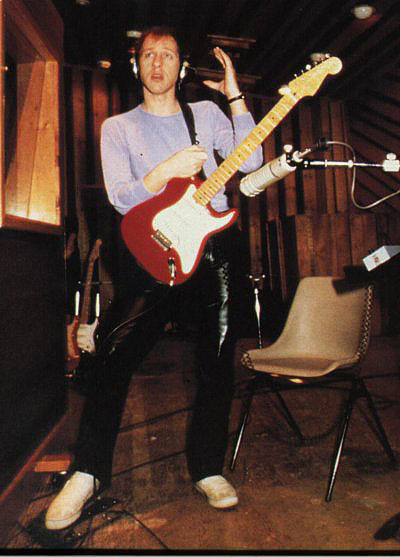 The last picture is definitely from the Power Station studios in new York, early 80ies, I think some other pictures which seem to be from the same session say that they are from the LOG session (theoretically local hero and Infidels were recorded at the same studio in that period, too). 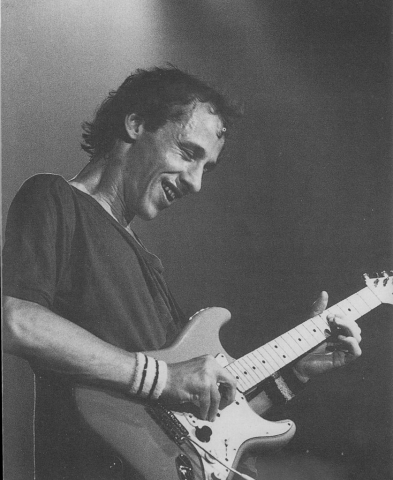 there is another picture in the Oldfield book on which Mark plays the 80470 Strat, it is b/w but I have it in small in colour so it is red (also check the position of the volume knob). 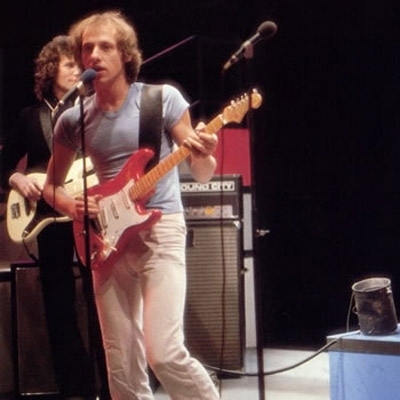 On the very first pictures of this guitar it has a white volume knob (december 77 until january 1978), then it had the greenish pickguard of the other Strat (spring and summer 77), in late 77 he played the 68354 Strat with the greenish pickguard, and in early 79 this guitar here had the white pickguard again but now without poti knob. 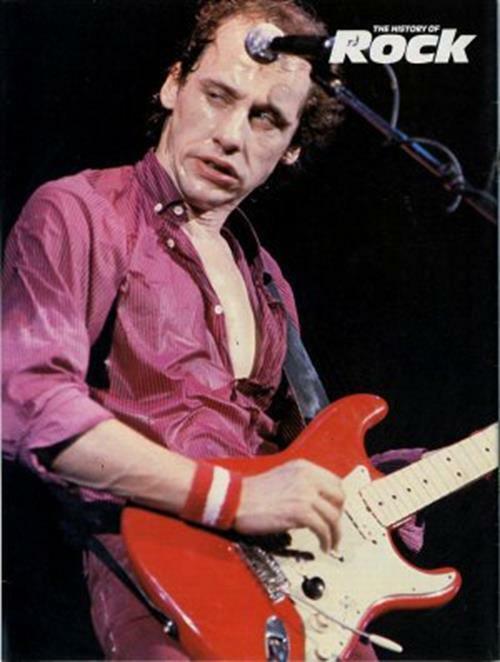 It seems to be a non-standard poti (solid shaft instead of split shaft) but no idea what this means (compare my thoughts in the iSound article: http://www.mk-guitar.com/2011/11/22/the-isound-st-new-sounds-for-the-stratocaster-does-it-help-to-get-the-mark-knopfler-sound/). Is that gold hardware (tremolo block) we see on the last photo? I thought the same, but maybe is it just the lighting ? 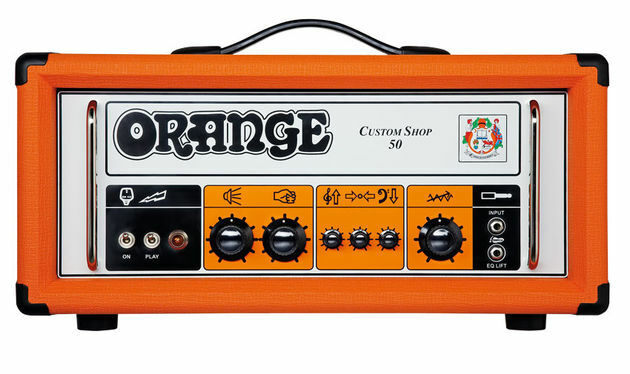 For anyone interested, the black knob seems to be a match for the larger knobs Orange use on their amplifiers. I use one of these on my red strat and it looks spot-on. In the Lady Writer video clip, the ends of Marks strings hang out a lot, but it would be a lot of effort to get this result with kluson tuners. 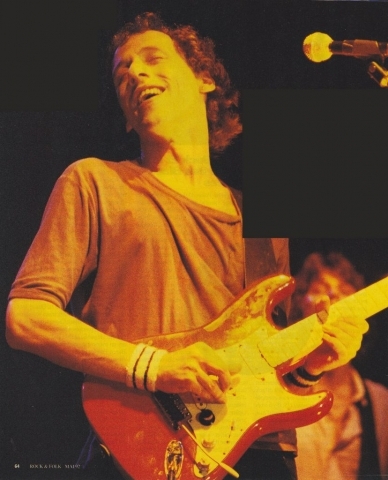 Is it possible that the maple neck strat had tuners where it wasnt possible to put the string end in and bend it? 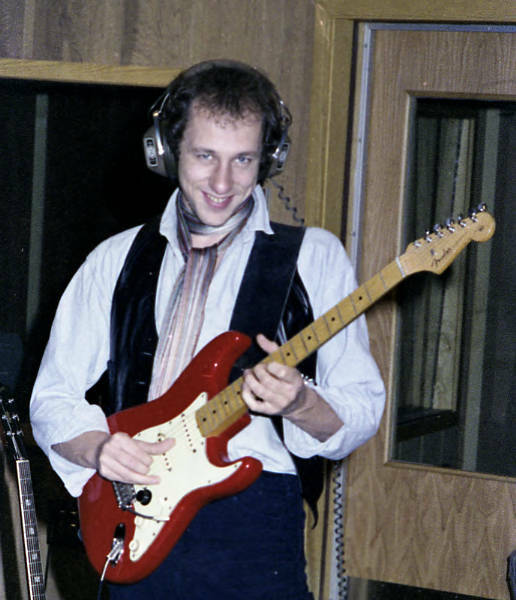 Yes but the strat in Lady writer clip is the maple one, and I think the pic you’re talking about is the rosewood one ? 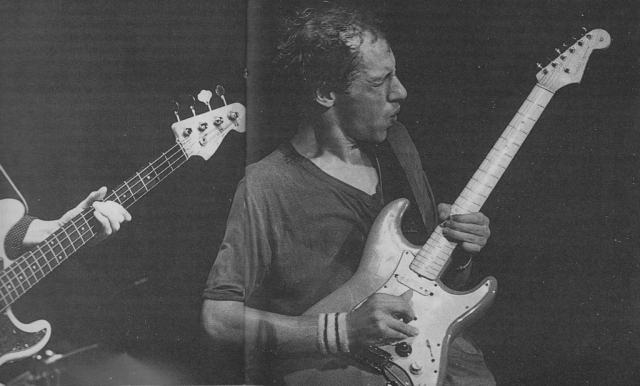 Does it mean that both strats had same tuners ? Ingo…I want to install the pickups 57/62 for the tone of this strat (the rockpalast) .. but what capacitor to use? ceramic, polyester, ? 0.1uf or .022 uf? Thank you! greetings from Brazil! Thanks for the absorbing history of this composite guitar. One question though: you mention that the original neck on this guitar was a two piece maple, i.e. without “skunk stripe” as the original one-piece maple necks the early strats had. 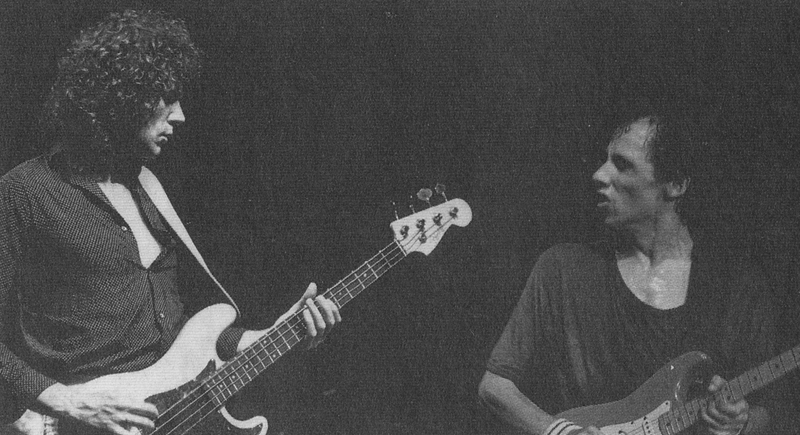 You also estimate the year for the neck (assuming it was fender original) as 59 or 60. However, specialized fender literature says that 2-piece maple necks were introduced in production by fender during the early CBS years (1967 for the first time) That would imply that the neck on this strat is either a fake or, if original, is 1967 or later. What do you think? I must correct what I stated: After checking in other books (One must never trust just one source) it seems that Fender started offering the 2 piece maple necks as a custom option as early as 1960 and until 1968 or so. 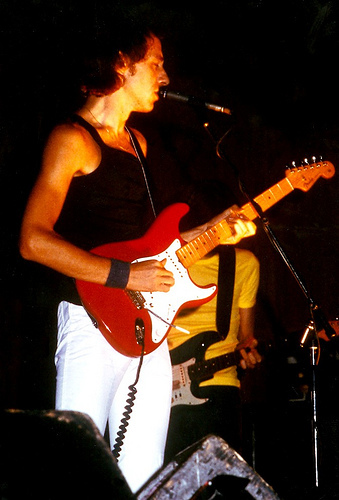 Therefore the 2 piece maple neck in this strat might very well be an authentic fender neck from the period 1960 to 1965, as the headstock is not the large-format introduced by CBS in 1965. 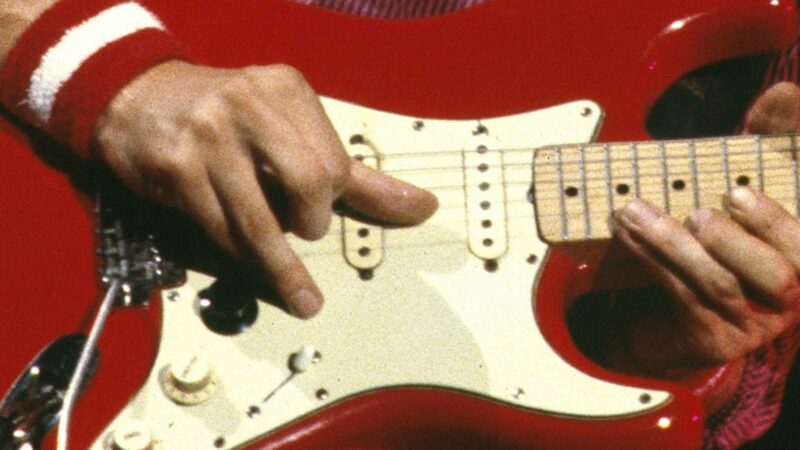 In fact the period can be even reduced, as the Fender logo in this strat is the original “spaguetti” logo and not the transition logo that appeared in the small format headstocks from the summer 1964. Taking all the above into account, and assuming of course the neck is genuine, then it could be from the period 1960 to summer 1964. It seems however that the 2 piece maple necks are quite rare overall, and it is a bit surprising that the fingerboard was in such an immaculate state taking into account that it was already 17 years old when purchased by Mark in 1977. It is likely the original 1962 neck. The fingerboard is NOT original! I guess Mark wanted a maple neck Strat (which were harder to find in England at that time than early 60ies Strats) but got this 1962. He asked a luthier to modify it to his needs (new colour, new pickguard, new fingerboard. one or is it just one White layer? In fact I recently found a DS gear list from about February 1979 in an old magazine, and this also quoted the serial numbers but just said two Strats (68354, 80470) and two Telecasters being used, not indicating which one was yours or Mark’s. 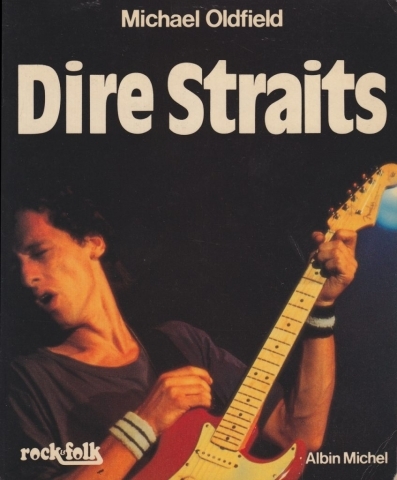 A later list appeared in an 1980 book by a German journalist with the same serial numbers but both 68354 and 80470 for Mark’s Strats. So here the mistake was introduced. 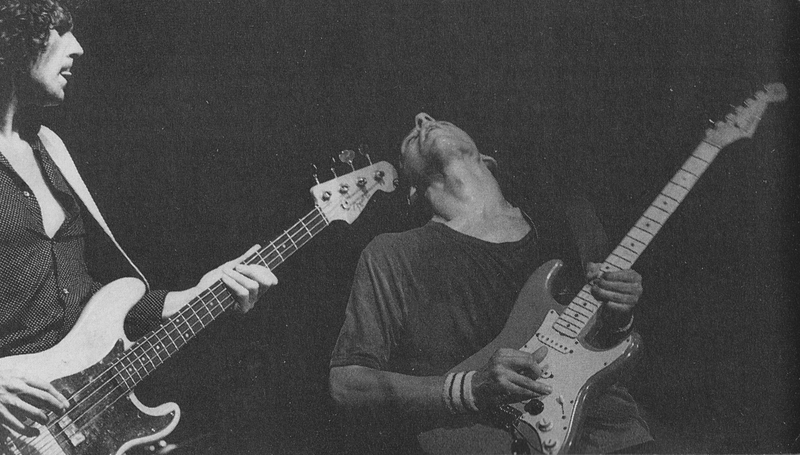 The 68354 was confirmed for Mark’s ’61 rosewood neck Strat in the official guitar style book decades later. 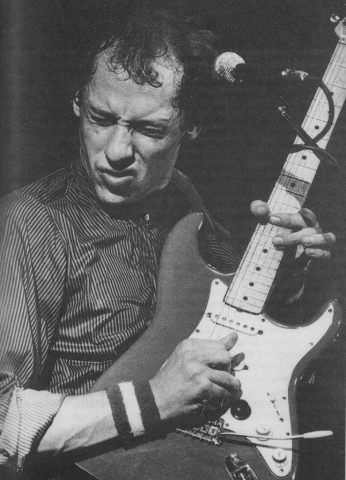 From the book “The Fender Stratocaster” from author Dave Hunter, Mark Knopfler seems to have said in Vintage Guitar Magazine Issue 2001 (i’ve traced it down to the may issue, still availabe) that he believes it to be a Japanese copy. It has since been sold on an auction for charity. Anyone have this issue to verify? Yes, he says he played a copy, and a 1961 original Strat. That is all that is said about this in this magazine. 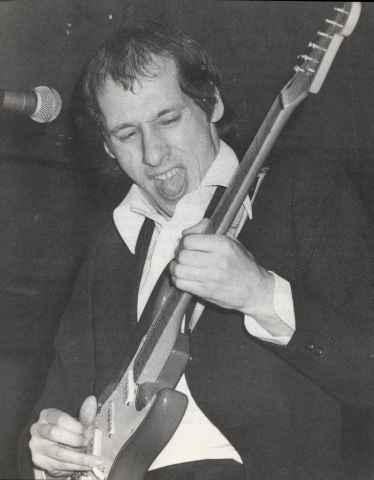 In fact the big question is what eactly this guitar was, half copy, half original? One thing is sure: there was no ‘commercial’ copy (I mean other than something custom built) with these specs available in 1977, neither.